A level crossing usually known as a rail road crossing, is an intersection where a railway line crosses a road or path at the same level, as opposed to the railway line crossing over or under using a bridge or tunnel. Barriers cover either whole road or half the road, there are also warning lights and an alarm. Gates are on both sides of the railway, staff close them as trains goes through. Gates or barriers are operated by the person using the crossing. These crossings sometimes have telephones and lights. There are no barriers or gates, however there are road traffic signs at these crossings. Stiles are self-closing gates are on both sides of the railway. Some crossings have stop lights. 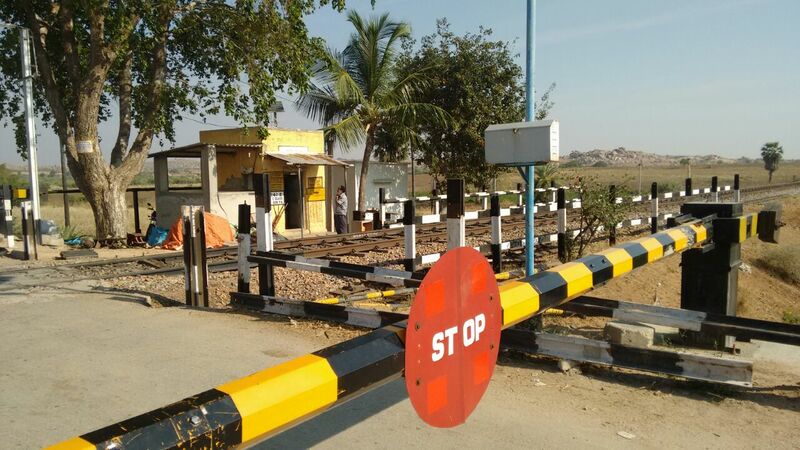 In terms of warning systems, level crossings are either passive crossings which have warnings such as signs, or active crossings which have automatic warning devices such as boom gates, flashing lights and warning tones. Fewer collisions take place at level crossings with active warning systems. Today radar sensor systems for automatic level crossing free detection are a cheap way to improve safety of level crossings. angle, without causing any obstruction to the passage of wheel flanges. rail tracks, i.e, one main track and another branch track crosses each other. A crossing in which the intersecting railway tracks are perpendicular to each other.